For long years, learning is associated as a painful task. But, do you know that learning can actually be a fun activity? Conventional teaching focussed on teaching students to get good grades. The times have changed, the time demands to learn more than grades. How does this happen?Researchers have proved that when a child enjoys learning, it benefits students to retain and understand the practicality of the subject-matter. But, what remains a question, can comprehending a subject be exciting? 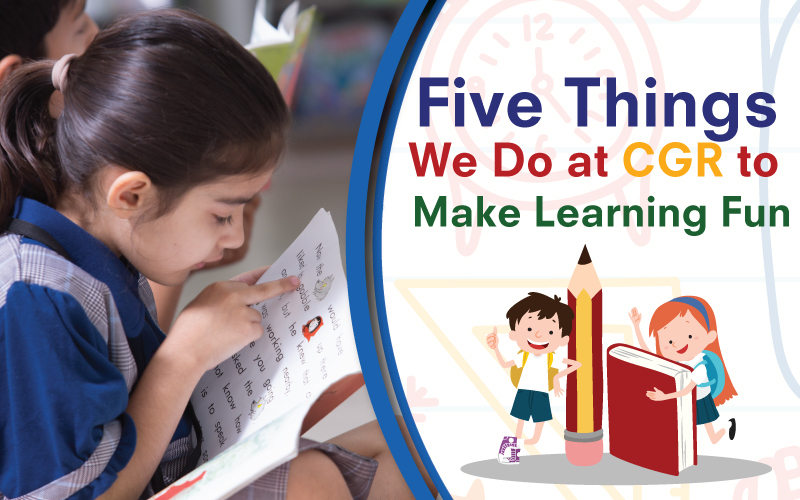 At CGR International School, we understand the significance of a robust foundation for successful careers and building students’ dreams. And, we believe that continuous learning is something that can take them to achieve their goals. Below are some of the ways in which we support student learning to make it a fun activity. Sports has a major role to play in one’s learning. Throughout decades, encouraging students to involve themselves in sports showcased significantly to enhance their performance and attention. Often, these sports need not stick to the ground, there are many activities from where learning a subject is combined with sports which builds curiosity among students to concentrate on the game. It inevitably lets our students learn with the game. Moreover, we ease up from learning, as the school organizes sports and cultural competitive to keep the spirit up among the students. Learning is incomplete when the theory is not applied to situations. Incorporating hands-on learning is a great way to make learning fun. Different aspects of concepts require experimental experience. We immerse students in scientific experiments to explore their learning in the classrooms. Many a time, all the concepts do not permit to carry out an experiment, in such situation, we use case studies. This allows students to place themselves in a situation and react accordingly. Learning with case studies helps our students understand implementation dimension of what they understand in a lecture. The last three decades have been revolutionized with high integration of IT in classrooms. IT has almost become an essential tool today to ensure quality learning. But, only the right usage of computer-aided teaching can nurture students to learn and enjoy their classes. We, at CGR, use Information Technology in a way that provides a scope to understand the subject the deeper and have a vivid picture of what one is learning. Using IT for learning, not only involves almost all the facets of human senses it also creates impressions of the subject in mind. Technology is fast-moving today. It is the time where Industry 4.0 technologies have seen its way in every sector. But, is the curriculum enough to make them ready to face this connected and robot world? At CGR, we bring in experts to teach our students the newer technologies to be confident to face the competition. We build a platform for students and assist them to learn the latest happenings across sectors to evolve them as young leaders. We groom to acquire skills not just to equip them for today, but also for tomorrow. It only surprises us that these ways work well with trained teachers. However, above mentioned ways are only a part of our teaching methodology. There are also a number of activities that we do at our school that enable students to get and make most out of the school environment and curriculum. To know more about the school, talk to us.